Can you draw lightly? Do you have trouble rubbing out your drawings when you make a mistake? Do you need to rub so hard that your paper scrunches and buckles under your eraser? Does your line leave an indent in the paper once you have erased it? If you are a beginner, chances are that you experience one or all of these symptoms often while you are drawing. The good news is that stopping this is real easy! One of the first things that you need to learn if you are a beginner is how to apply the light touch to your drawings. Most people will start their drawing very nervously by thinking about what shape to draw and how each line fits together to make that shape. While we are concentrating so hard on getting the shape right, we tend to grip the pencil real tight and press firmly into the page to create our lines. Most of the time we aren’t even aware that we are doing it. The result is a dark, thick line that not only looks ugly but has no chance of being rubbed off the page cleanly without leaving some sort of dent or mark on the page. There are many benefits to learning how to loosen up our grip on the pencil to be able to draw lightly, and its not just so that you can rub out the line. Pencil control is a vital part of successful drawing. It will effect how well we can perform each step of the drawing process from establishing rough outlines to the final touches of shading. Very subtle changes in pressure with your pencil can result in significant improvements to your drawing, especially while shading. Soft variations of tone can only be achieved with a good level of pencil control. While I am working out my shapes, I like to keep the line-work really light, I sometimes press so lightly that my pencil barely touches the paper and leaves a line so thin and light that it can barely be seen. I can use that line to work out where other lines should be positioned. If I find that the line needs to be moved I can either rub it out easily or leave it there for effect. Often you will see completed drawings with light construction lines still visible to add to the character of the drawing. As the drawing gets completed and I am happy with the position of my lines, I can gradually increase the pressure of some of the line-work to create shading and/or a more permanent line. So, how do you create light lines while drawing? It starts with the grip on the pencil. 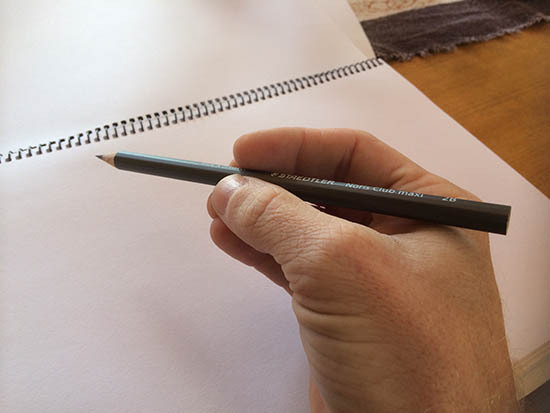 Rather than gripping tightly which forces the pencil into the paper, try holding your pencil about half way up the stem of the pencil by gently resting it on the edge of your third finger. 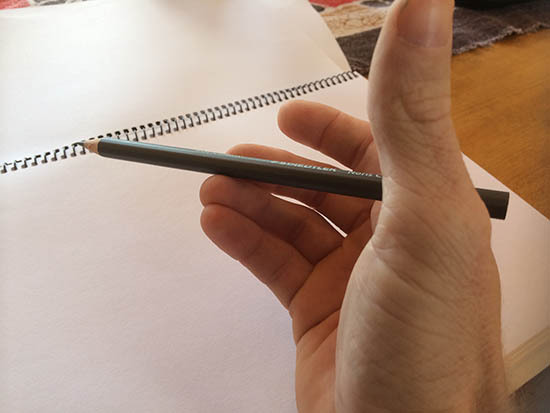 Use your middle finger to cradle the pencil into position with the end of the pencil resting on the inside arch of your hand. Your thumb and forefinger can close gently on each side of the stem for extra support to stop any pencil movement. It’s important not to grip tightly however. Allow the pencil to rest on the inside arch of your hand, with your fingers and thumb having just enough pressure to support the pencil. When you draw the line, let gravity and the weight of pencil be the only downward pressure that is applied. Now here’s the key… keep your fingers and wrist fixed in position and use your entire arm to make the movement across the page. If you use just your fingers you will force pressure and also limit the movement of your pencil. By using your whole arm you will find it much easier to create straight lines or smooth curves. 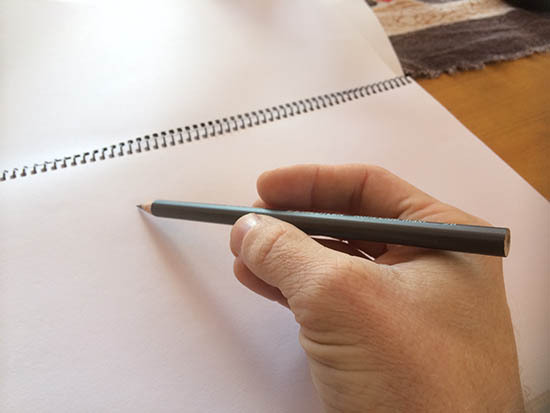 Another tip… Guide the pencil by pulling along in the direction of the line rather than pushing it, this will help you to keep the pressure light. Great drawings all have something in common. It is something that we should all strive for while creating our drawings. All great drawings share subtle variations in their line-work to create different effects that emphasize the important parts of the drawing and lessen the emphasis on other parts. Variations of line-work are also used to create the illusion of shading and depth. Often lines that aren’t as important in the drawing are drawn lightly to create a thin line that doesn’t steal your attention away from the important parts of a picture. It is vital for beginners to learn how to control the pencil while holding it lightly in your fingers. We need to be able to vary the density and value of the lines that we are making. It is impossible for us to do that if we are pressing firmly into the paper the whole time that we are drawing. Like all drawing techniques, it takes a lot of practice to perfect. The more you do it, the easier it gets and pretty soon you will be able to easily change the density of line without even thinking about it. Practice, practice, practice! I hope that you have enjoyed this art lesson and hopefully help you to draw lightly and improve your drawing skills. If it was helpful for you, please share it on your favourite social media platform by clicking on the icons below. If you would like more free art lessons please register here for more great drawing tips and tricks. You can also follow me on facebook, YouTube or follow new posts by getting the RSS feed. Happy drawing!